Hiking Kepler Track was a sweet conclusion to the South Island of New Zealand. I wish I could say the North Island gave us a warm welcome, but apparently we did something to piss it off. For one, the ferry ride across Cook Strait made Katie and I exceptionally green about the gills. Katie sat curled up with a hood over her head for the entire 3 hour ride refusing to move or speak. I was so bad off I sat outside, cold wind buffeting against me for two hours straight, just to keep my breakfast safely in my stomach. Despite our physical discomfort, it was a beautiful day. Such a shame we couldn't enjoy it, because from that day on we had horrible weather. Luckily, we spent the first half of the week house sitting for a friend, nestled in their beautiful self-designed home that wrapped around us like a warm blanket; a protective haven sitting on the edge of the bay in the midst of a blustering squall. How appropriate the home resembled a ship at sea! Unluckily, we had tickets to a rugby tournament, the Wellington Sevens, which forced us to venture out into the unfavorable weather. But we weren’t about to miss the chance to experience New Zealand’s favorite past time on an international stage. Our first day out was grey, but the wind and rain had receded, making us stupidly think the worst was over. This made us unprepared (how very unlike us) for the rain that inevitably came. Perhaps we were distracted by all the costumes? Because there were costumes. LOTS of costumes. Costumes are a Sevens tradition, but we didn’t realize they’re practically mandatory. In a stadium filled with spectators we were the only squares wearing, well, regular old clothes. Boring. After surviving the monsoon-like conditions and drunken revelry of the Sevens, we decided to take it easy with a four-day hike on the Tongariro Northern Circuit (because that’s our idea of relaxation). It was to be our sixth "Great Walk" of New Zealand, and we were ready to cross it off the list. Our first day provided cloudy but pleasant conditions. Perhaps our weather-woes had finally come to an end? Or not. Definitely not. As you can see, the views were hidden from us until the very last day. But to experience nature's extremes while striding through a volcanic wonderland was worth the sacrifice. It added to the other-wordly feel of our journey. 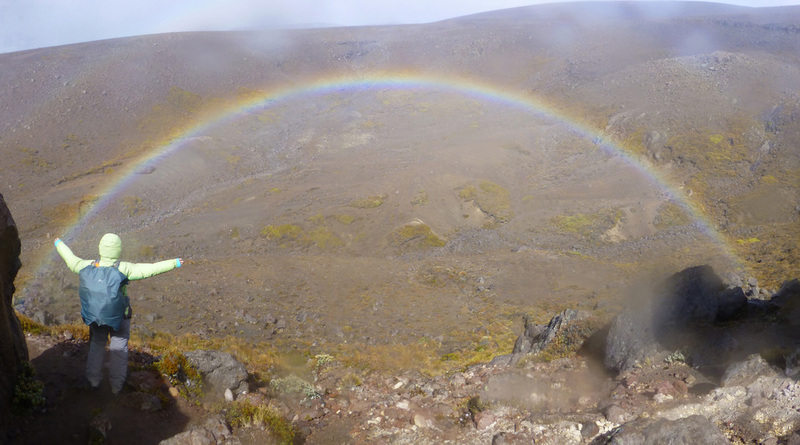 Besides, we'd already experienced pristine weather while hiking the Tongariro Crossing back in 2011. Talk about beautiful! With that hike under our belts, we didn't feel robbed of anything. On the contrary, I gained more survival experience! November 3, 2015 by Alice Taylor.